James and the Giant Peach, book by Timothy Allen McDonald and music and words by Benj Pasek and Justin Paul, is a quirky, family-friendly musical adventure that will take the audience from Europe, across the Atlantic Ocean to the United States all within a peach! 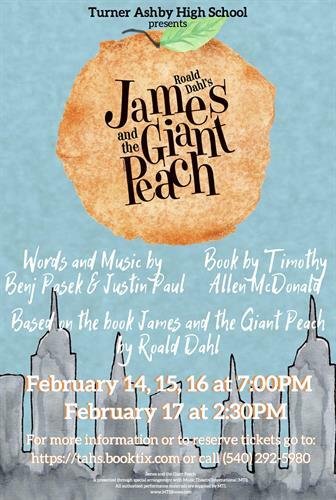 The musical is based on the popular children’s novel James and the Giant Peach by Roald Dahl. The show’s premier was in 2010 at Goodspeed Musicals in East Haddam, Connecticut. Get to know characters such as Centipede, Lady Bug, Earthworm, two mean Aunts and of course James. This is a show that every member of the family can enjoy. At Turner Ashby, we pride ourselves in student contributions to the annual musical. Students use their creativity to produce costumes and designs, and the show is run entirely by the collaboration of all students involved in the production. Critical thinking and communication skills are learned and practiced throughout the production, in actors, technicians, and orchestra members. This provides them a learning opportunity like no other and gives them a permanent ownership in their show!